Thank you for searching out our Vocation page. It is our hope that the information contained here will be of help to you should you be thinking of becoming a Diocesan Priest. Do you feel God tugging at you at times? 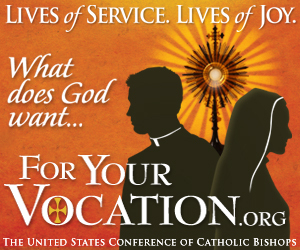 Have you ever thought of yourself as a diocesan priest, serving the People of God? Has the idea of becoming a Diocesan Priest or a Religious Sister or Brother ever crossed your mind? Do these thoughts excite you and cause you to want more information? We know that during your discernment, you will have many questions. We, too, have asked the same questions when we began our journey toward priesthood. When you come to a point where you would like to ask some of your personal questions and receive some assistance in your discernment, please feel free to contact our Vocation Director, Very Reverend Ron Zanoni at (702) 629-4438. Your personal vocation is important as one of the greatest gifts God will give to you. It is also a very personal part of your life, especially as you begin your journey with all kinds of questions, emotions, and concerns. Always remember that you are not alone as you discern. You are in our daily prayers as you search for what you believe God is calling you to do with your life.